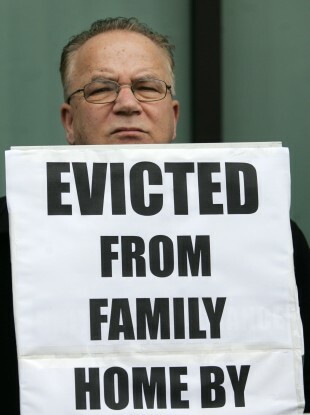 A protest against home repossessions in 2012. THE COURTS SYSTEM “cannot cope” with the amount of home repossessions it has to deal with, a Senator has claimed. Thomas Byrne criticised the fact that 84 repossession cases were listed to be heard by a county registrar in Meath on Monday. Speaking in the Seanad today, the Fianna Fáil Senator said his problem is “not out of disrespect for individual country registrars”, but because he thinks it is “completely wrong” the cases will not be presided over by a judge. Junior minister Kevin Humphreys, who was speaking on behalf of Justice Minister Frances Fitzgerald, told Byrne that a total of “8164 Civil Bills for an order of possession were lodged in the Circuit Court” in 2014. “As the Senator will appreciate, if all these cases were to be heard by a member of the judiciary it would have significant recourse implications for the courts,” Humphreys said. The Labour TD noted that county registrars are “highly qualified” and “must have practised for at least eight years as a solicitor or a barrister”. He said that when an affidavit setting out a defence has been filed, the county registrar transfers the civil bill to be heard by a judge “at the first opportunity”. Byrne said he was “angry” with this scenario, describing Humphreys response as “a stark acknowledgement of failure”. “The idea that the excuse for county registrars handing out repossession orders and kicking people out of their homes is that there are too many cases and if we got judges involved, the system would not be able to cope. That is effectively what the Minister of State has said – the system could not cope if we got judges to hear all these repossession cases. It is an extraordinary admission by the Government. It is making me angry and I am sure it is making people angry across the country. “It is wrong,” he added. Humphreys said he too was “very angry” – over “the financial mess we inherited in this country”. “It is not nice to be reminded of how Fianna Fáil left this country. I know the Senator gets angry when reminded, but we have had to tidy up this mess. Any order made by a county registrar is subject to appeal to the Circuit Court. There are no plans to amend the current legislation,” he added. Email “Courts 'cannot cope' with amount of home repossessions”. Feedback on “Courts 'cannot cope' with amount of home repossessions”.